The All New, All Daring Delusional Honesty! : Mantlegacy: The Man-Brute Called Woodgod! If anyone's been following me for any length of time, you'll know that Bill Mantlo has long been one of my favorite writers, in spite of, well, things that have come into focus recently (and which will soon be the topic of a blog entry). He wrote many, many Marvel comics in the seventies and eighties, including my perennial favorites Rom, Spaceknight; Peter Parker, the Spectacular Spider-Man; and of course The Incredible Hulk (which I've reviewed here, here and here). 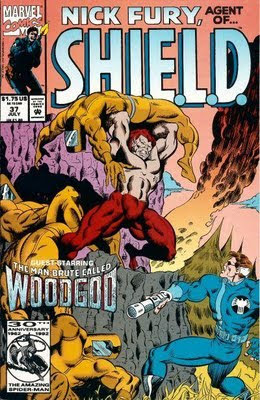 I thought it was high time I introduced those of you who might not be as familiar with the esteemed Mr. Mantlo's work to one of my favorite of his creations: the man-brute called Woodgod! The character who would later become most closely associated with the writer's work on the Hulk, Woodgod actually starred in his own inaugural adventure in Marvel Premiere #31 (August, 1976) by Mantlo and then-neophyte Marvel artist Keith Giffen, who was also illustrating David Anthony Kraft's Defenders stories at the time. Noteworthy is the fact this story was not Mantlo and Giffen's sole collaboration: they also created the "Sword in the Star" series the same year in Marvel Preview (which introduced another obscure character by the name of Rocket Raccoon...hey, whatever happened to him?). And to top it all off, Marvel somehow got superstar artist Jack "King" Kirby to draw the story's cover. How d'you like them apples? At first, Woodgod seemed like an animal-human hybrid who could've stepped forth from the High Evolutionary's wicked world of Wundagore, but thankfully, Mantlo kept his creation isolated in that first story. "Birthday!" tells the story of David and Ellen Pace, two geneticists who created Woodgod, a humanoid creature whose appearance echoed that of Pan, the Greek god of the wild. He had dark skin, the barest hint of horns on his head, and the feet of a goat. Why exactly the Paces chose this visage for the one they would treat as their son remains unknown, but Woodgod did enjoy accelerated mental growth to match his adult body. Months passed until the townspeople of Liberty happened upon young Woodgod. Instead of being understanding, they only saw a monster, and laid siege to the Paces' farm, inadvertently releasing an experimental nerve gas that killed everyone in the town but Woodgod. The shrieks the townspeople made as they died caused young Woodgod to connect the two. Henceforth, "the scream" had killed his parents and the townspeople. Major Tremens, Pace's superior at Vertigo Base, sent a team to investigate and found a howling-mad Woodgod. 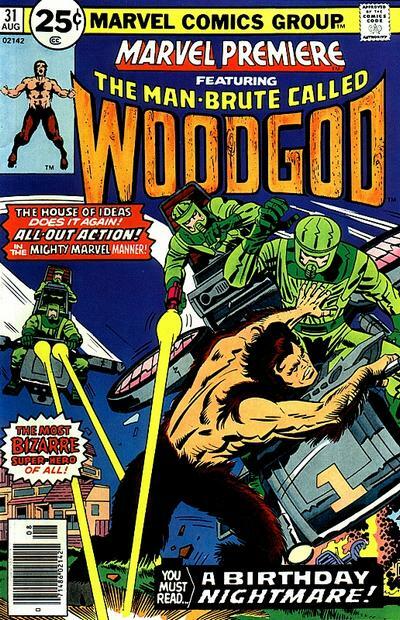 Woodgod's next appearance was in Marvel Team-Up #53-55, scripted by Mantlo and drawn by superstar artist John Byrne. The Hulk happened upon the young Woodgod on the same day as the previous issue's events. The two fought until Spider-Man arrived after having heard of the Green Goliath's arrival, at which time they teamed up and fought Spidey instead! Eventually Major Tremens captured all three and brought them to Tranquility Base (! 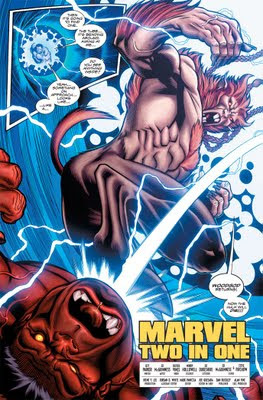 ), planning to shoot Woodgod into space and blame Spider-Man and the Hulk for the tragedy in Liberty. The heroes escaped and Woodgod killed Tremens before hiding anew. 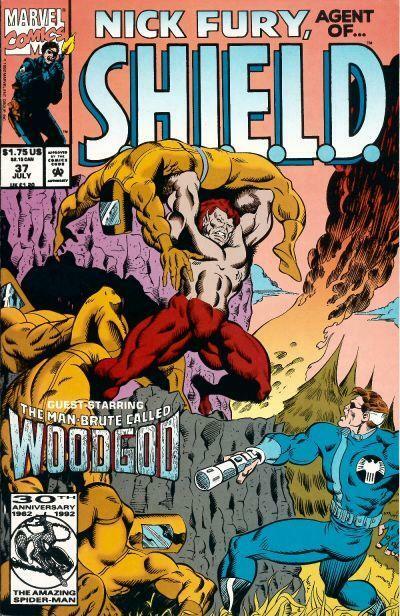 Eventually Woodgod resurfaced in Incredible Hulk #252-253, where we discovered that Woodgod had salvaged his parents' research and traveled to a remote area of Colorado. Teaching himself to read and write, he soon used his advanced intelligence to carry on his father's work, creating a race of humanoid animals he dubbed the Changelings. First Doc Samson and General Ross encountered them, followed by Fred Sloan, Rick Jones, Betty Ross and the Hulk himself. They found themselves caught in the middle of a war between rival factions of the Changelings, with Woodgod's own creation, Leoninus. At the end of the battle, Woodgod renounced his leadership of the group, saying that they should lead themselves, and perhaps one day they could reveal themselves to the public without fear. After Bill Mantlo left Marvel, the character was sadly nearly forgotten, popping up here and there but never for more than a bit role. Shortly after his last appearance with the Changelings, Woodgod had been captured by the Stranger, an enigmatic alien prone to collecting specimens for his laboratory world. The superhero Quasar helped free him and others the Stranger had captured during a battle with the Overmind, after which the sometime Avenger transported the whole lot back to Earth (Quasar #13-16, 19-20). Sadly, no sooner did he reunite with his fellow Changelings (and enjoy an adventure with them in Marvel Comics Presents #76) than the armed forces of Trinity Base (!!) killed them all, claiming they were private property created with their financing. Woodgod survived but the trauma of seeing his brethren executed caused him to regress to his earlier, more hostile persona. Nick Fury and his S.H.I.E.L.D. agents helped Woodgod escape, faking his death and promising to shut down Trinity. Check Nick Fury, Agent of S.H.I.E.L.D. #37 for the details. After the death of his Changelings, Woodgod was again captured, this time by the newly-malevolent Department H, shown in a cameo in Alpha Flight (1997 series) #13. At some point, he escaped their clutches, only to again be brought off-Earth and mutated even further by Xemnu the Titan, who returned him to battle the Red Hulk in Hulk #30, a scant few months ago (as reviewed here). Who knows where Woodgod will appear next? He doesn't appear to be all that popular, and no writers save Mantlo seem to have a decent enough handle on what makes him tick. They all enjoy using him as a prop, or walking back Mantlo's later characterization as leader of a race of beings like himself. True, it may be that he and the Changelings are seen as knock-offs of the High Evolutionary's New Men concept, and perhaps that reputation's deserved. Still, I long for the return of the more textured characterization of this character who's unjustly ignored. After five substantial, promising appearances in the Bronze Age, Woodgod has become a footnote in Marvel history when his pedigree indicates he's deserving of more. Now, I'm not asking for him to be made part of the next Avengers team, but a little respect is due, no? Recommended Reading: Marvel Premiere #31; Marvel Team-Up #53-55; The Incredible Hulk #251-253; Quasar #14, 19-20; Marvel Comics Presents #76; Nick Fury, Agent of S.H.I.E.L.D. #37; Alpha Flight (1997 series) #13; Hulk (2008 series) #30. The only Woodgod stories I have read are the ones in the Hulk comics though the less said about the Loeb like tale in Hulk 30 the better ! I did purchase Marvel Premiere 31 a few years back at my LCS. I did so because I was told I should read it by one of the fellows who worked there. I must confess I only took it out of its plastic to take a quick glance at the story and art. Perhaps it's time to crack open the plastic again and finally read it. 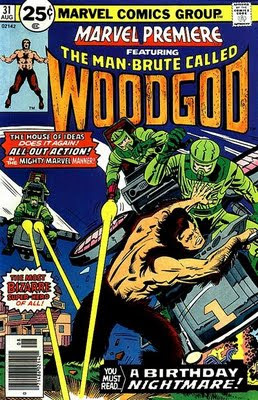 It doesn't surprise me that Marvel landed Kirby to do the cover for Woodgod's introductory issue. He and Mantlo grew close during Bill's youth, and the Boisterous Boy often sat nearby observing "The King" as he worked on various masterpieces. Hulk #252 was the first comic book my dad ever brought home for me to read, so I guess it was unavoidable for me to become a huge Mantlo fan and go on to create Smash Tales years later. 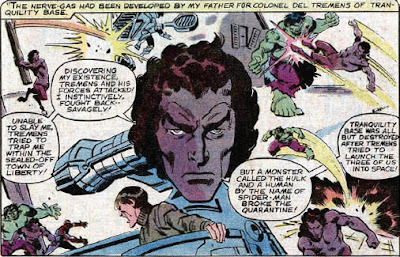 I remember falling in love with Sal Buscema's work immediately, where Woodgod and his Changelings brought a strong amount of drama, range of emotion and sense of dread. I was so worried about what was going to happen at the end of the issue with the rival factions facing one another. It's more than a little bit sad to learn of his fate following my first-ever comics reading experience. Under Mantlo's writing, Woodgod exhibited such intelligence and humanity, and I had hoped for a bright future for his people: either someday gaining acceptance by the outside world or simply living in peace within their colony. Learning that those beautiful creatures, the Changelings, were killed (particularly those gorgeous centaurs) off just seems unnecessarily cruel. His post-Hulk adventures earned him a justifiable distrust, even a hatred of humanity, because of how awfully humans had treated him. On top of that, to have him further mutated in Hulk #30 into a beast less human than before just takes away all the beauty and romanticism of the character. That, as they say, was the deepest cut of all.